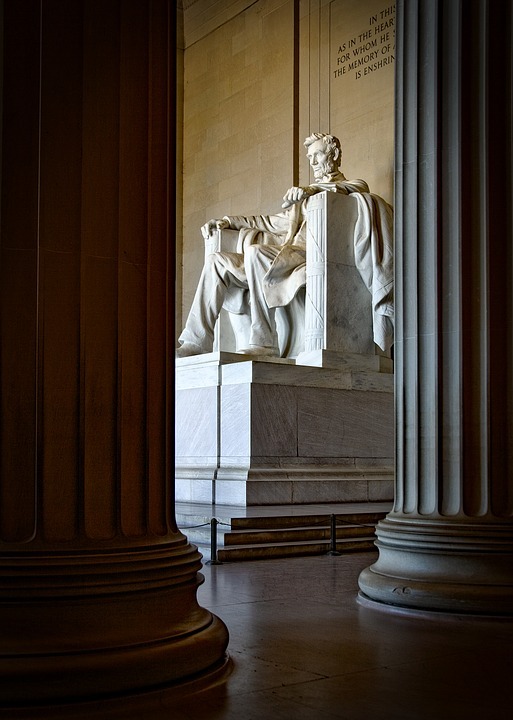 Le mémorial de Lincoln, en anglais Lincoln Memorial, est un monument construit en l'honneur d'Abraham Lincoln, 16e président des États-Unis, et inauguré en 1922 dans le West Potomac Park, dans le prolongement du National Mall à Washington. Grand bâtiment de marbre blanc en forme de temple dorique grec, il abrite une statue monumentale d'Abraham Lincoln assis et les inscriptions de deux de ses plus célèbres discours. Le Lincoln Memorial a été le lieu d'où ont été prononcés plusieurs discours dont le célèbre I have a dream de Martin Luther King, le 28 août 1963, lors de la marche sur Washington pour l'emploi et la liberté. Comme d'autres monuments du National Mall, dont le mémorial des anciens combattants du Viêt Nam, le mémorial des anciens combattants de Corée et le National World War II Memorial, le mémorial de Lincoln est géré par le service des parcs nationaux américains. Any and all of the landmarks in our nation's capital are impressive but this is one of the most impressive. It's simplicity and classic architectural design is pure beauty. The historic significance is exemplified by the writings that were chosen to be chiseled into the walls. You will need at least one day at the Mall to properly visit the memorials in the vicinity. All three war memorials are in the area as well as views that will take a significant number of pictures to capture. Several bathrooms on the area and there is an elevator at Lincoln for the mobility challenged. The Lincoln Memorial is a national treasure honoring the 16th President of the U.S. It is where Martin Luther King Jr. delivered the I Have A Dream Speech. This memorial is probably the one most recognized and visited in DC. As a result one must be patient when trying to capture the image in a photograph. But a picture one must take. It is in close proximity to the Vietnam Veterans and Korean War Veterans Memorials. The view from the memorial of the reflecting pool and the Washington Monument is breathtaking and worthy of a few snapshots. I have visited this memorial numerous times and will always try whenever I am in the area. I highly recommend that you do the same. From the steps of Lincoln Memorial you have very beautiful views of the National Mall and of Lincoln himself. While it is very neat to see during the day, I highly suggest the night time. Much better views with everything the Lincoln memorial and Washington monument all lite up. There are many people around, but easy enough to get some good pictures. On the east bank of the Potomac River in Washington stands one of the biggest attractions of America. Lincoln Memorial is located in the center of the capital of the United States. Located amidst the beautiful and well maintained West Potomac Park, the memorial building is about 30.5 meters high. Here you can see the seated on a throne U.S. president Abraham Lincoln. This beautiful statue is made of white marble and is about 6 meters high. A national icon where many historical speeches and manifestations have taken place. It has an inspiring Lincoln statue and also a perfect picture spot with the National Mall as a background. Although it is open all day, I recommend to visit near dusk or evening for best experience.